Hello and welcome to Crafting Friends Designs! I'm Kate and I'm excited that you've stopped by and I look forward to getting to know you. If you enjoy making fun and unique projects, beautiful and classic home decor or even quick accessories to use or wear, then you're going to love it here! Isn't it just the best feeling when you finally finish a crochet project and you're able to give it to a loved one? Knowing that you can bring comfort to friends and family through your handmade items is one of the best feelings to have! Your talent and your time are priceless and I want to help you get as many thank you's, WOW's and compliments as possible. If you're like me, weaving in the ends of yarn at the end (or even during) of a project feels like torture. I've created an amazing collection of afghans with the appliques worked right into each row to eliminate our struggle. 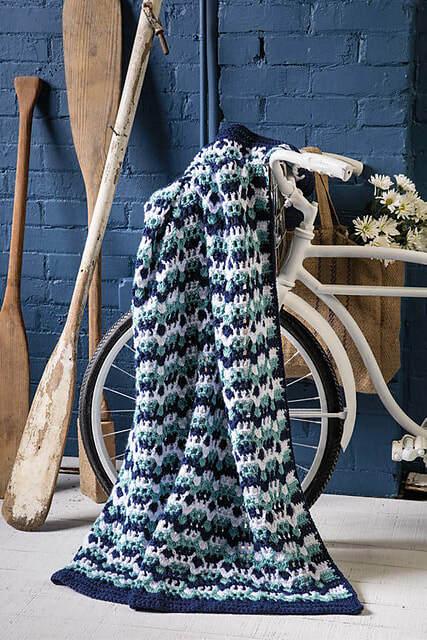 If that sounds intriguing to you, you must check out the Heartbeat Chevron afghan. I know that you'll appreciate that most afghan designs I offer can easily be customized so that you can make the size you need from infant to ginormous. I've been crocheting for 30+ years and until a few years ago, the thought of crocheting clothing was intimidating to me. I don't want you to feel that way too! I've created some simple infant, toddler and child sized clothing patterns that are simple and quick to work up. If something has held you back from crocheting clothes, here's your chance to give it a shot and feel accomplished. The Snap Dragon Infant Dress is one of my absolute favorites. You're probably wondering...Now just who is Kate? Is she real and what is she really like? 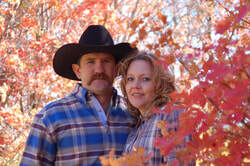 This is my husband Brodie and I. We met at the county fair in 2007, were married 4 months later and now have 4 beautiful girls. I began crocheting when I was 10 years old. My grandma taught my mom and my mom taught me. My first project was a doll afghan and let me tell you - it was extremely crooked. I quickly learned how to end and start rows so they remained straight and I took off from there. When I was about 14 or 15 yrs old, I was asked by a few neighbors and friends if they could buy my afghans. I was so excited to think they would trust me to make something for them and more excited that they were willing to pay me for doing something I love. I have crocheted over 100 afghans and have photos of most of them on my blog to keep record (for fun) of what designs I've used and color combos. It's always fun to look back through them and remember who they were given to and the feelings I had. I had always been scared of crocheting clothing. I was worried that I would put so much time into a project and it would turn out all lopsided and terrible. In 2011, I decided it was time to get over that fear. I found a free pattern online and gave it a shot and....I was hooked! The creativity started flowing. I knew what stitches I wanted to use for dresses, but figuring out the sizes was kind of a pain to begin with. I really didn't have any intentions on selling patterns at the time. One day, a photo of my peach Ribbon & Lace dress was shared on a Facebook page and I had so many requests for the pattern that I started working them all up. Vwaa Laa...Here I am today. Still enjoying my family and crocheting away. When I'm not crocheting, you can find me in the kitchen making old fashioned candy to keep up a family tradition, out in the garden enjoying the flowers or camping in the mountains with my family. Living in Northern Utah, we enjoy the freshness of spring, the beauty of summer, the colors of fall and even the snow through winter. My girls show me the joy in seeing everything in life with fresh and innocent eyes and have taught me to try to see the best in even the little things. They are my biggest cheerleaders and I'm thankful each day that my love of crochet can bless our family financially so that I can be home with them.